Having established a new creative position for the college through a comprehensive brand audit and positioning review (see the work) we began implementing that strategy across all major communication channels. And then provide them with clear and simple access to the means to fulfil that action. 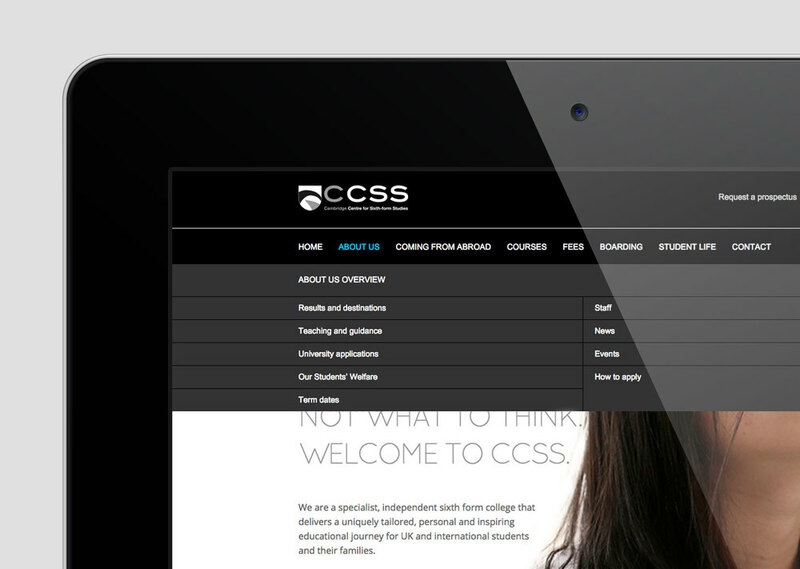 The visual interface was then designed to create the right ‘feel’ for CCSS – calm, friendly, premium and intelligent, with the college values built in to the message rather than overlaying it. Visual cues and compelling content were created to encourage users to scroll. We deliberately chose scrolling approach as it allowed us to engage users instantly, through visual impact and the use of core messages; it also gave us greater flexibility to use creative copy and commissioned imagery. This type of open layout also allowed our story to flow and as per our brief, social media sits naturally as part of and throughout the site rather than as icon ‘bolt-ons’. And to offer the best online experience for the audience, and the best solution for our clients, their brands and services this site is fully responsive; allowing a seamless experience for the user across any platform they want to view it on. Overall we were aiming for a premium but approachable position. Initially, over 4 days we created a library of bright modern reportage style photography, show casing life across the college, both inside the classroom and out. This became the main tool of the visual approach for both prospectus and website. The design was then deliberately stripped back, reducing the colour palette and number of type styles that appeared in the prospectus to allow the photography to take centre stage. We deliberately split the content into a front end given over to full spreads of photography and minimal text highlighting the personality of the college while the bulk of the core information sits at the back. What we ended up with was a cooler, more knocked back but grown up approach – a more distinct look in comparison to the market we were in, and a more engaging message for our target audiences.